My last post on the rotted corner showed the damage that dad and I found after opening up the wall. 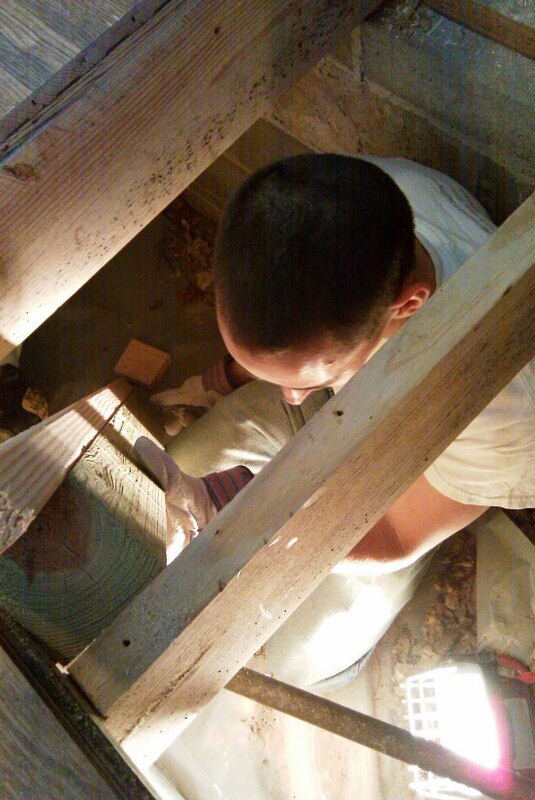 The rot had progressed along the seal plates and joists about 36" in both directions from the corner. It also made its way about 32" up several of the wall studs near the corner. The work in this post took place on the Saturday before our spring break at GT. My dad got there about two in the afternoon, so we were limited on the amount of time we would have to work that afternoon. Logan also came along to help out. Our main focus was getting the floor joists and the trusses supported so that we would not have any issues with sag when we cut the wall studs and the floor joists out to remove the rot. 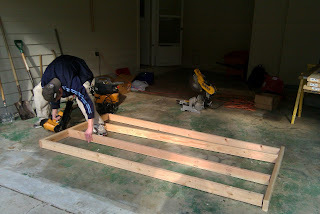 Dad started by removing some more of the wood floor strips and then cut out the 1/2" decking that they used for sub-floor. The following two pictures show me moving supporting materials to crawlspace to support the floor joists. Dad had already done most of the heavy work while Logan and I were gone to Home Depot to get supplies for rebuilding the floor. 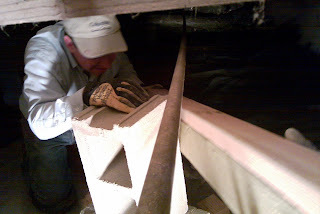 He had moved 4 or 5 concrete blocks and a 20 ton bottle jack to the crawlspace. 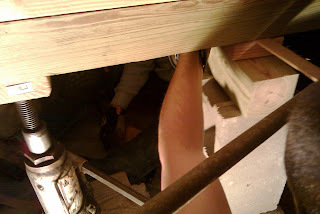 The next picture shows the location of the gas line and how it was really close to being in the way of our work. Always be careful using a Sawsall in close proximity to electrical wire or gas lines. Dad used a combination of the blocks, the foundation blocks, 4x4s and the bottle jack to support the joists. The next image was taken after dad had already used the jack to put force on the cross brace. 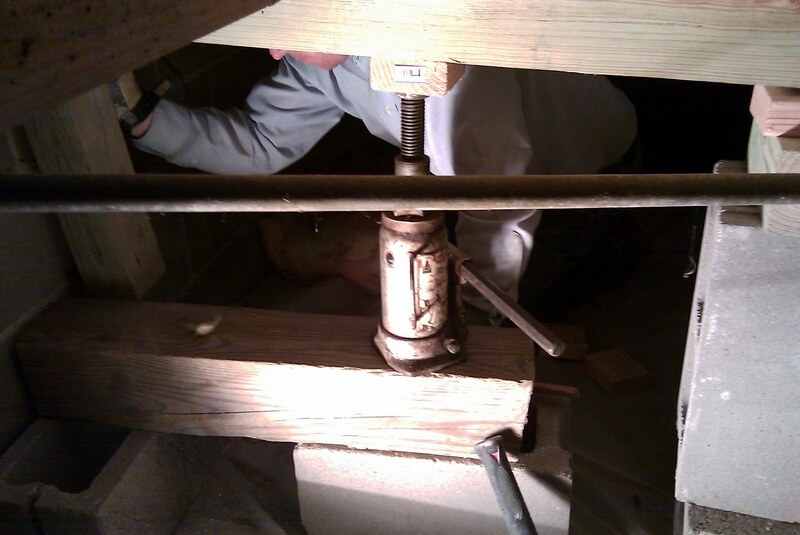 We used a stack of block and wood with wood shims to make sure the third supported joist had equal force supporting it as well. 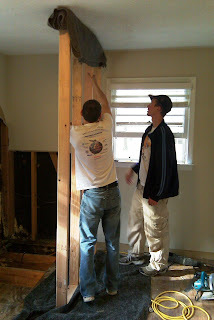 While we were working on supporting the joists, Logan and Annie put together a false wall that would be used to support the trusses so that they would not sink after we removed the wall studs in the corner. It only took them about 20 minutes to put it together. They also christened my dad's new framing nailer. The last step was to squeeze it through the door to the room and wedge it into place. We were finished and had the tools locked up by 6:30. We also got the Home Depot trip out of the way for getting the building materials. I do wish I would have prepared more for Logan to do because he did not always have an active job. Sorry Logan, I will be more prepared next time. 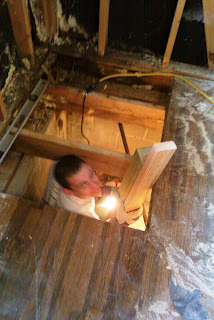 The next corner rebuild post will go into details of removing the rotted sections and replacing the floor joist section.